Learn More” swaptitle=” ” rel=”programs-highlander” id=”program2″ excerpt=”Join us for a great hands-on opportunity for kids and teens with special needs to roll up their sleeves and experience” excerptpos=”above-trigger” targpos=”inline”] new tastes and textures as they mix and measure an edible work of art. 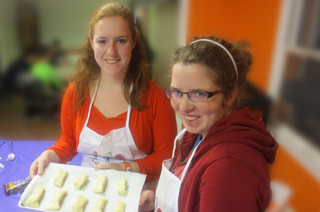 Each session features a hands-on, nut-free, culinary experience and a food-themed craft. All of our friends take home their finished product along with a laminated recipe card which they can use to make the recipe at home.